This is an open letter and formal request to the people in charge of the former Saint Kevin property – we are asking for a chance to walk inside these buildings one last time and say a proper good-bye. My name is Robert Gillis. I lived my first 25 years in Uphams Corner, and now live in Foxboro. Although I am a professional computer programmer I also have written a paid published op/ed for the Foxboro Reporter for 17 years and for the Boston City Paper for the past eight years. I am not a reporter. But I present these credentials to you to demonstrate that I write about the things that matter to me; the things that need to be shared with the community. 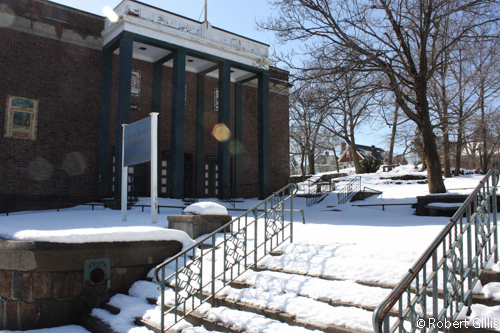 You are, I am sure, well aware that Saint Kevin Church and School were the spiritual childhood home for countless thousands of Dorchester residents and far more school children. As an overview: The church and school were created in the 1940s or so and were kept alive and flourishing by its most famous pastor, the late Father J. Joseph Kierce. Father Kierce was a legend in Uphams Corner, and the school and church meant (and continue to mean) so much to the tens of thousands of former students and parishioners. 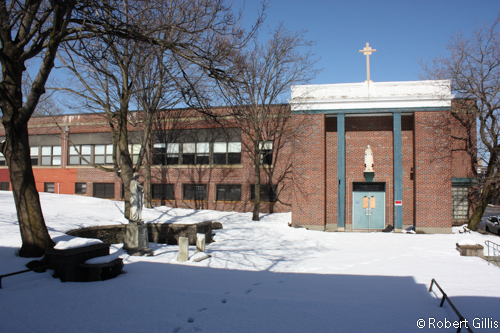 The school closed its doors in 2008 as part of the Archdiocese of Boston changes. We miss it. Seeing the outside of the shuttered church last summer, walking the grounds, I realized the real reason Saint Kevin’s present state bothers me so much — it’s because it’s just rotting there, boarded up. If the school or church were OPEN, that would be different… But this is worse — this is something that has died, and was not buried. Forgive me, this isn’t poetry, it’s from the heart – Saint Kevin Church and school died in 2008 and no one took the time to bury it. How can you mourn the loss of something that hasn’t been buried or recycled back into nature? Like thousands of other Dorchester kids, I was baptized in that church, made all of my sacraments, and graduated (class of 1979). And I attended church there until I moved away to Foxboro. There are thousands of memories imprinted on those walls. Thousands of stories. Whether we still live in Dorchester or across the country, we are still OFD, and we are all still Saint Kevin alumni and communicants. And Saint Kevin? Permanently imprinted on my heart of hearts. We need a proper good-bye. Something that lived and was so vibrantly alive and meant so much to so many, something that gave birth to and nurtured so much energy, so many dreams, so many classes of kids, so many dramas and masses and sacraments and funerals and weddings and playground fights and teachers and books and now… DEAD. Boarded up. And slowly decomposing, forgotten. Abandoned. In flux. Until, FINALLY, a plan is in place. New construction is finally about to begin. A literal phoenix from the ashes. I have read, and been told, that that many, many former parishioners and alumni have repeatedly been denied the opportunity to walk the inside of the property one final time. We respectfully DEMAND a proper good-bye. If a church official is denying the request, then I respectfully suggest that official does not understand how important these buildings are to us and should be overruled. The time to do this is running out. The construction equipment will soon be there. The memories scattered to the winds. True, scattered and reborn – new housing, new futures — Father Kierce would be so happy. But we need to say good-bye. Our beloved church and school will soon be reduced to rubble – as it should have been after the church was decommissioned and the school closed. But we parishioners and faithful – after many, many decades, need that final wake, that final funeral, a chance to say a proper good-bye. I, and so many other Dorchester residents, and former Dorchester residents, are pleading for one final INSIDE visit to those two buildings. A chance to say a proper good-bye, to put the ghosts to rest, to take our pictures, to make peace with our past, and to thank the spirits of the priests and nuns and faculty who worked so hard to guide us and teach us. To stand one last time inside those school rooms. To walk those halls. To say a final prayer in a place no longer a church, but forever scared and holy to us. We can be supervised. We won’t bring the children. We will wear construction hats. We will sign waivers. We will travel in groups. But allow us a final chance to say good-bye to the place that for so very many of us, will always be — sacred ground. Please allow us this chance to close this chapter of our lives for good — because it’s the right thing to do. Cristine: These are the classrooms upstairs from the church. The church was completely stripped out except for the altar and the green marble backsplash behind it. They were to be removed by the Archdiocese the next day. A very eery and sad sight. Where can I pick up the Boston City paper? I’m moderating Foxboro Jaycees Candidates Night LIVE on Foxboro Cable Access 4/10/2014 – please watch, meet the candidates, and please vote! → ← Regarding CVS/Caremark’s decision to stop selling cigarettes and tobacco products: THANK YOU!